Longevity- How long does concrete last? Let’s ask the ancient Romans. The Colosseum is made of concrete, and it has certainly withstood the test of time. Looking at a typical 20-year lifespan, maintenance costs for concrete are very low, sometimes as low as half that of asphalt. Asphalt’s maintenance costs over 20 years can be as much as 80% of the initial cost to construct. This includes having to coat it every few years and completely resurface it about every 10 years. Concrete, by comparison, doesn’t lead to such interruptions to your business. Cost Effective- The price of asphalt has skyrocketed with the increased price of petroleum by about 250% over a 5 year span, according to the Bureau of Labor Statistics. 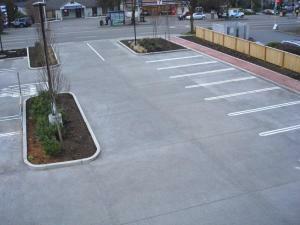 Lower Temperatures- Concrete is a lighter color, which reflects rather than absorbs heat. This reduces the effects of a “heat island” and lowers the cost of cooling any adjacent buildings. Durability- Unlike asphalt, concrete resists potholes, ruts, and “wash-boarding”, that ripple-like effect that asphalt develops when heavy vehicles rollover it constantly. Concrete has a good, rigid structure that allows a 5-inch slab of concrete to handle the workload of an 8-inch slab of asphalt. Customizable- Concrete can be colored and textured to fit the environment. Since the color goes into the mixture as opposed to being painted on, you don’t have the recurrent expenditures of having to repaint parts of you parking lot that see heavy use. You can greatly improve the aesthetics of your parking lot and even your whole campus with colored concrete! Green- Speaking of color, concrete is very green. Runoff is low toxicity and concrete can contain recycled materials such as recycled concrete aggregate, slag, and fly ash. Asphalt may be cheaper to install initially, but you will pay for it in the long run. For more cost-efficiency, concrete pays for itself in lower maintenance costs, durability, and environmental friendliness. For more information about Bayou Concrete, or to learn about our full line of products and services, just call us today at 504-667-2180 or fill out our Contact us form and let’s get to work on your new parking lot! . We will be happy to schedule an initial meeting to discuss your needs.